There are few things better than barbecue brisket. What makes it even better is the perfect barbecue sauce. A good, rich barbecue sauce adds flavor to smoked brisket whether it is sliced to chopped, but the most important benefit is the moisture it adds. Barbecue brisket can dry out quickly, either in the smoker or more likely once it is cut up for serving. To prevent the meat from getting too dry, you want to add a little sauce. Whether you like it slathered or lightly brushed with sauce, these barbecue sauce recipes are exactly what your brisket is asking for. 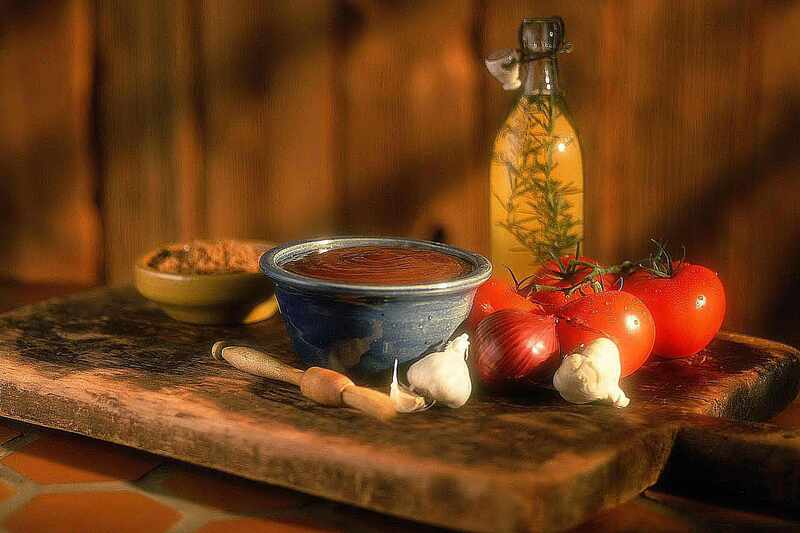 In Texas, BBQ Sauce is a sweet and spicy mixture of tomatoes and spices. Somewhat old-fashioned when compared to popular sauces of today. this barbecue sauce starts with a stock. It takes a little more time to make but this brisket sauce is certainly worth the wait. If you need a quick and easy barbecue sauce for brisket, this is the one. You probably have the ingredients in your kitchen. The great thing about this barbecue sauce is that while it has a sweet flavor so it doesn't overpower the flavor you have spent so much time developing in your smoked brisket. This is a classic central Texas barbecue sauce; it may seem a little strange by modern standards, but this is the way brisket sauces were made in the early days of Texas Barbecue. The flavors enhance but do not overpower the smoked meat, making this the purists answer to the perfect brisket. Another classic brisket sauce that is loaded with savory and sweet flavors with just a hint of heat. This sauce combines the old central Texas sauces with more modern mixtures, making it a thick and rich sauce that is perfect poured over a brisket sandwich. This variation of the traditional Kansas City BBQ Sauce is a thick sweet sauce with a touch of heat and vinegar to give it a little kick. so is a perfect brisket sauce for those who want to slather it on think. While spicy, you can adjust the heat by adjusting the cayenne. Where most of the barbecue sauces that are so good on smoked brisket are thick and heavy on the tomato, this is a thinner sauce with a tart flavor. If you want to stay away from the sweet, then this is a great sauce to try. While the liquid smoke used in this recipe is optional, it is a great way to add some extra smoke flavor to your barbecue brisket. This barbecue sauce kicks up the heat. Use this hot and spicy barbecue sauce on brisket only if you are brave enough. Let your guests decide just how brave they are, but you should have a milder sauce ready for those who are not so brave. Walter Jetton was President Johnson's favorite caterer and pitmaster. Jetton prepared his barbecue, Texas-style of course, for some of the most important people of the 1960's. This classic style barbecue sauce starts with a stock and is perfect for brisket giving it a barbecue flavor from long ago. It is interesting to point out that Texas-style barbecue sauces evolved from something we today would call gravy. Tart and spicy, this brisket sauce has a rich citrus flavor that lifts up the smoke of the meat and makes for an incredible combination of flavors. Make this sauce a day in advance, or at least when the brisket hits the smoker so that the flavors can blend to perfection. The richness of this sauce is perfect for brisket. The maple syrup gives it a savory sweetness that works perfectly with the smoky flavor of the meat. This sauce is so on brisket, but also a fantastic general purpose barbecue sauce.